Mineral dusts in the atmosphere, originating primarily from dry regions like the Sahara desert, have significant influence on climate. Because of this they need to be accurately represented in climate and weather prediction models. Recent observations of atmospheric Saharan dust by our scientists provide strong evidence for the existence in mineral dust layers of particles that are predominantly vertically aligned. This finding is totally unexpected, as until now atmospheric aerosol particles have been thought to be randomly aligned. The alignment is thought to be due to atmospheric electricity associated with the dust layers. Computer modelling indicates that the alignment can significantly alter the properties of the dust layers, including the amount of light they transmit, absorb and reflect. This has been termed a "Venetian blind effect" from the way particle "tilt" can influence the amount of light and heat transmitted through the atmosphere. 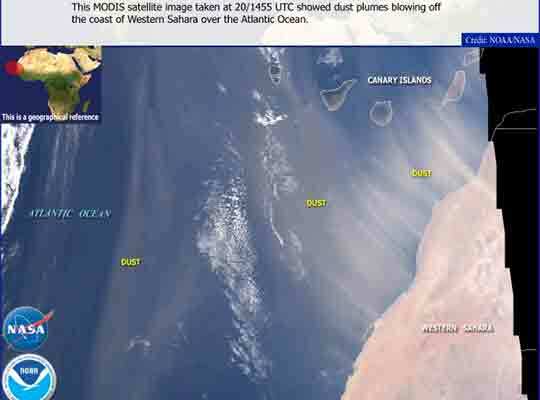 Change in this and other properties can have significant impact on measurements of dust clouds from satellites and ground-based remote sensing instruments, and possibly also on dust movement through the atmosphere. The observations, described in a paper published in Atm. Chem. Phys. 7, pp.6161-6173 (2007) were carried out on La Palma in the Canary Islands (shown at a later date in the image above). Our team used a very high-sensitivity instrument for measuring the polarization of light. This PlanetPol polarimeter was developed jointly by Centre for Atmospheric and Climate Physics (CACP) and the Centre for Astrophysics Research (CAR), initially for use in astronomy. The observations coincided with a dust storm which, for a brief period, between 3rd and 7th May 2005 stretched from the Sahara to cover La Palma - see the AURA-OMI satellite image animation showing daily "aerosol index" over the Atlantic between south America and north Africa. A long-standing puzzle surrounds long-range transport of atmospheric dust, namely that large particles are frequently observed in the atmosphere where according to models they should have been removed by gravitational settling. It is now well documented that a hitherto unknown atmospheric process appears to slow down the so called "dry deposition" of larger dust particles (see e.g. Maring et al. (2003) J. Geophys. Res. 108, 8592). To provide a potential explanation, we have proposed that the electric field associated with the alignment can also modify dust transport by aiding the retention of charged, larger particles within dust layers [ACP 7, p.6161]. The process works like this. Small and large dust particles tend to be charged with opposite polarity. Since larger particles fall faster under gravity, separate areas of positive and negative charge will form. The resulting electric field can then counteract gravitational settling of larger particles by coupling them to smaller ones via electrostatic attraction. This coupling effectively increases the surface area of large particles, slowing down their settling (generally, large particles tend to dominate by mass, while small ones dominate by surface area). We have now modelled this process and the results indicate that particles as large as 8 micrometers can be effectively "levitated" by the electric field. The plots below compare the vertical concentration profiles of 0.2 and 8 micron particles, initially and after 4 days of transport through the atmosphere, with and without the effect of dust charging. Reference: Z. Ulanowski, O.V. Kalashnikova, P.W. Lucas and B. Bercot (2008) Effect of Charging on Radiative and Transport Properties of Atmospheric Mineral Dust. Dust Workshop 2008, Leipzig 15-17 Sept.
A field campaign called DREAME (Dust Radiation, Electrification and Alignment in the Middle East) will take place in Kuwait and Saudi Arabia in April and May 2009. The campaign will answer questions concerning the precise origin, magnitude, extent and impact of the dust-charging phenomenona by the use of sun photometry, optical polarimetry, lidar, and in situ measurements of electrical properties and particle alignment. Specially developed radiosondes will provide vertical profiles of charging and particle sie distribution. DREAME involves collaboration between Universities of Hertfordshire, Reading, Alexandria, Energy Research Institute in Riyadh, UK Met Office, Public Authority for Applied Education and Training (College of Health Sciences), and Directorate General of Civil Aviation in Kuwait. Preliminary results show that mineral dust was generally accompanied by electric charging, and the field may in some cases reach sufficiently high values for dust particle alignment to occur. The aerosol radiosondes developed for DREAME were used to profile volcanic ash concentration and size distribution during the 2010 Eyjafjalla eruption. Saharan dust intrusions have been detected several times over our remote sensing observatory in Bayfordbury, not far from Hatfield. One such event occurred on the 28 of June 2012.